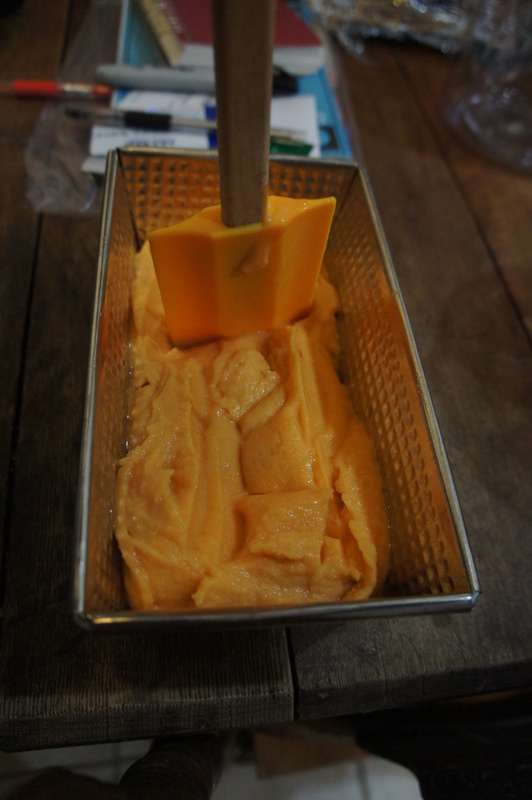 The first time I tried persimmon (or kaki in French) was when I was in Paris. I was doing one of my favorite activities: a culinary adventure in one of the ethnic and colorful areas of Paris: Chinatown, trying to find some green mango. Why green mango? I was under influence of a very nice movie: The scent of green papaya. I wanted to make a green papaya salad, inspired by the Vietnamese cooking scenes of the movie. 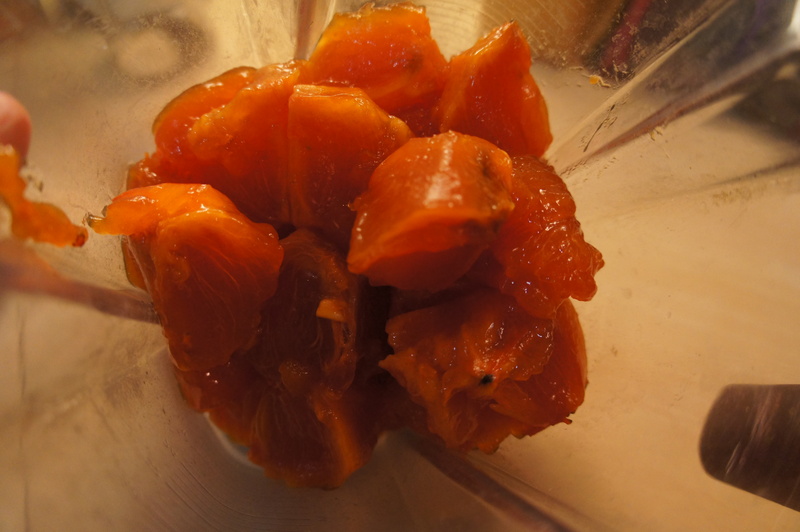 And as usual, I came back home with a variety of new products to try, including persimmon. The word “persimmon” comes from Powhatan; an Algonquian language word that means “a dry fruit.” The biological genus this plant belongs to is “Diospyros”, which means “food of the gods”, a real gift when the days are cold and gloomy. Persimmon makes my days happy during the winter. The orange-red color is a zest of bright Mediterranean color (sorry, Asian blush) during our long winter. I love this fruit; it makes me feel good. And it is true, persimmon is good for you. It is high in vitamin A (33% daily values per 100g), vitamin C (13%) and minerals such as magnesium, copper and manganese. “A persimmon a day (which contains twice as much dietary fiber per 100 g as apple) keeps the doctor away. And not only keeps the doctor away, it’s also great for your heart”. It is a good source of fibers, phenolics, minerals and trace elements that make persimmon preferable for an anti-atherosclerotic diet. Persimmon, originally native to China thousands of years ago, is Japan’s national fruit. There are hundreds of varieties of persimmons, with only two main types of available commercially: astringent, often called hachiya persimmon, and non-astringent, or fuyu. It is important to know with which one we’re dealing with if we really want to enjoy this fruit. The astringent kind – rich, sweet, spicy – is tart until fully ripe. 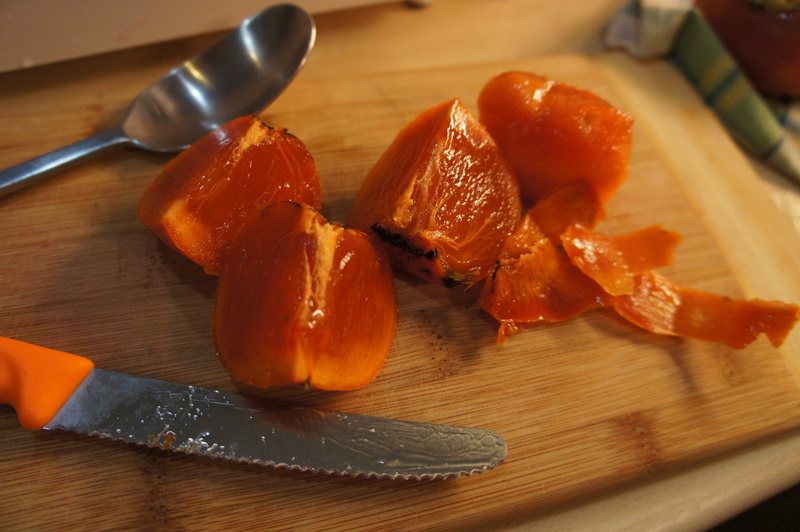 A hachiya persimmon is ripe (a process that can take several weeks) when it is so soft that it sweets, almost jelly-like flesh practically bursts through their skins. Not esthetically nice to see but so good! When I get some persimmons that need to reach maturity, I leave them in a paper bag along with an apple, which produces extra ethylene to soften the fruit. Refrigeration is not necessary and may actually ruin the fruit. In contrast, fresh fuyus are generally firm, crispy and delicately sweet when not fully ripe. It can be eating like this or later, fully ripe when they get darker, jelly-like and amazingly sweet. You can peel them but the skin is perfectly edible. You can use them in salads or baked them in pies and cakes. Hachiya can be used in jams or compotes. 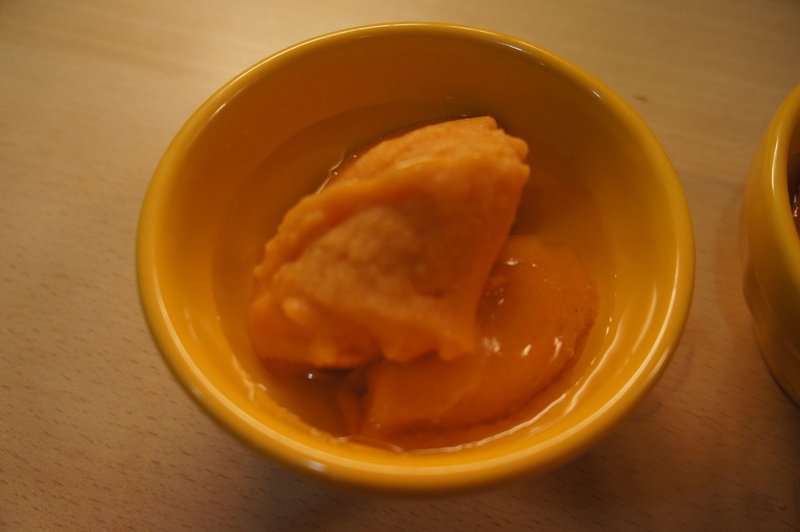 I like to eat them just like this but for the first time, I have decided to give a little twist to this interesting fruit during the holidays’ season: a persimmon sorbet with a zest of malty astringency. 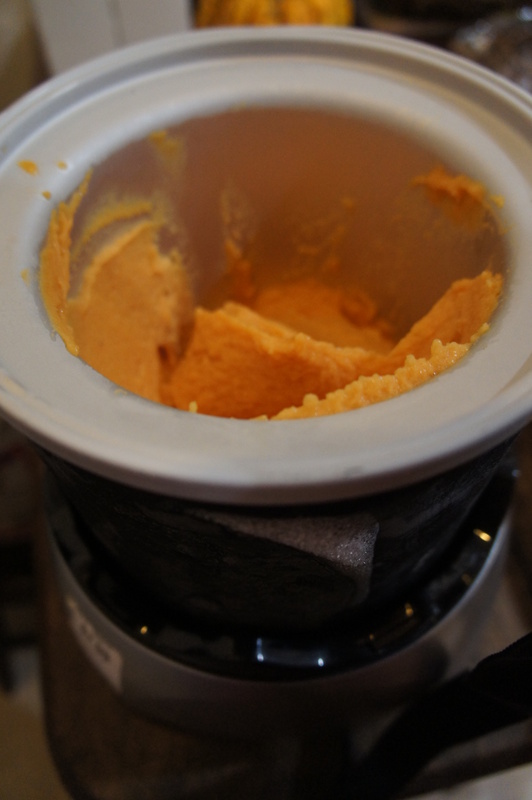 This sorbet is really nice like this, but we really enjoyed it with a splash of vodka. We call it in French “un trou normand”: literally, the Norman hole. Originally, calvados and apple sorbet, it is served in the traditional belief it shall restore appetite between to dishes. We just enjoyed it, as an evening treat when we were watching a movie. I used fuyu persimmons for this recipe. Make sure to let them ripen until the flesh has some give. 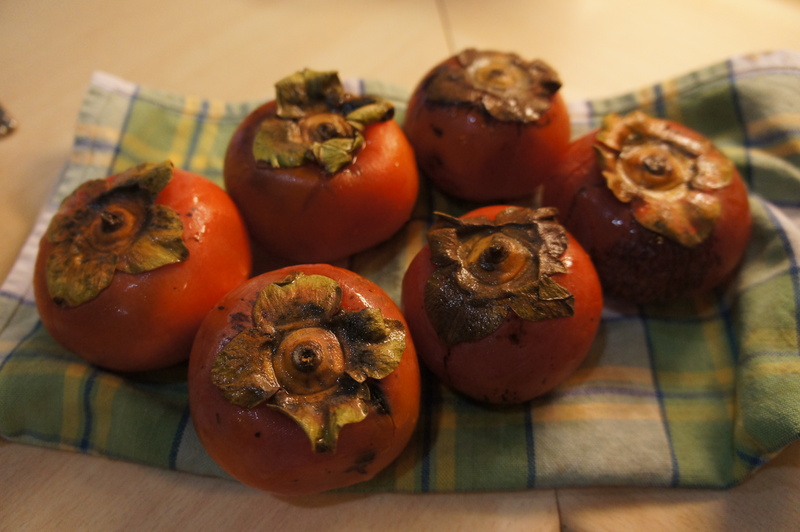 Acorn-shaped hachiya persimmons might be a better alternative but they were not available. Again it is important to let them ripen until the skin is well blackened and the flesh is as soft as jelly. 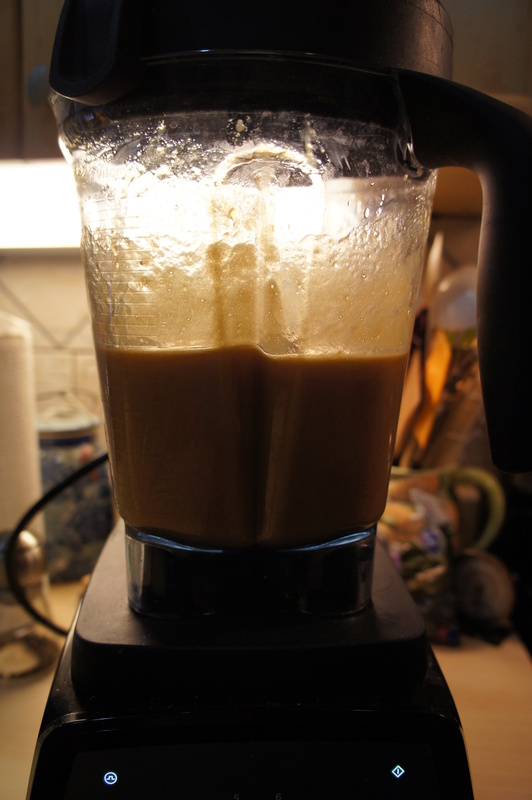 I try to keep the level of added sugar (any kind) between 5 and 10 %, as stated by the World Health Organization. I used for this recipe a beer from Hop City – Barking Squirrel Lager that has pleasant hop bitterness. Soon, I will try this recipe again (when we will have finished the sorbet) and I will use this time one of our favorite beers of the moment: Fracture Imperial IPA from Amsterdam. It has a more pronounced hops flavor than the Hop City beer, and I am sure it will create a great alchemy with the persimmon’s delicate sweet flavors. 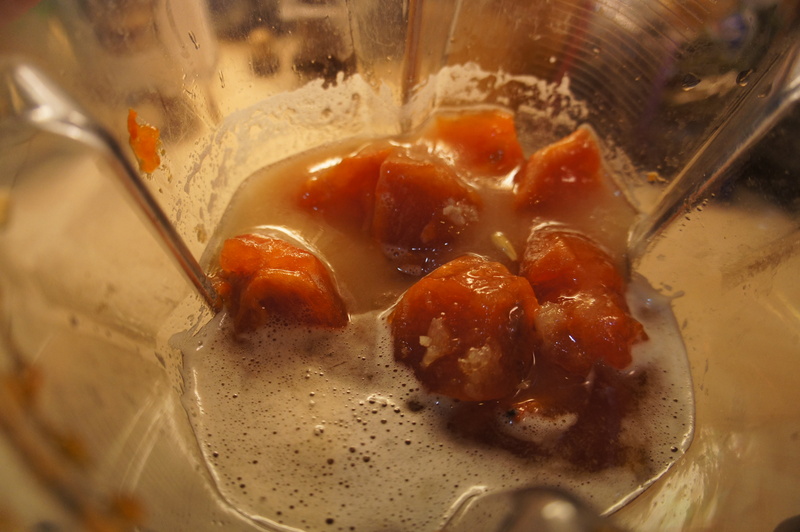 Combine together persimmons, sugar, beer, lemon juice and salt in blender or food processor and process on high speed until very smooth, about 30 seconds. 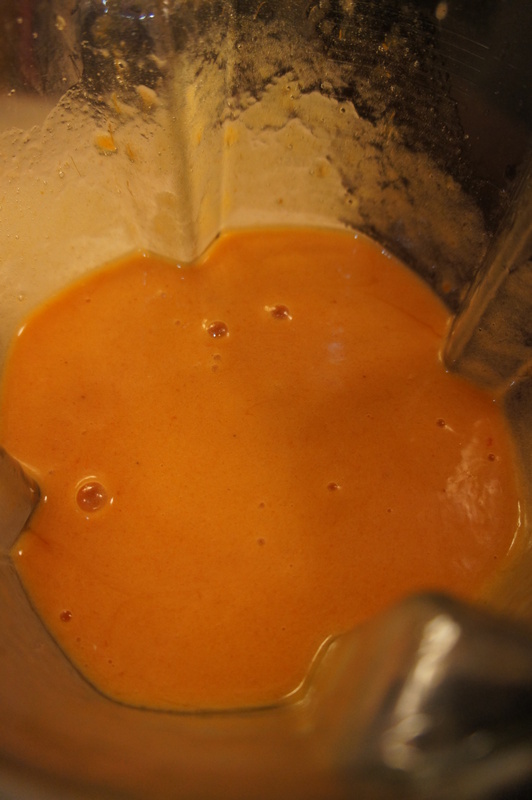 Place mixture into refrigerator to cool, 2 to 3 hours. Churn in ice cream maker according to manufacturer’s instructions. 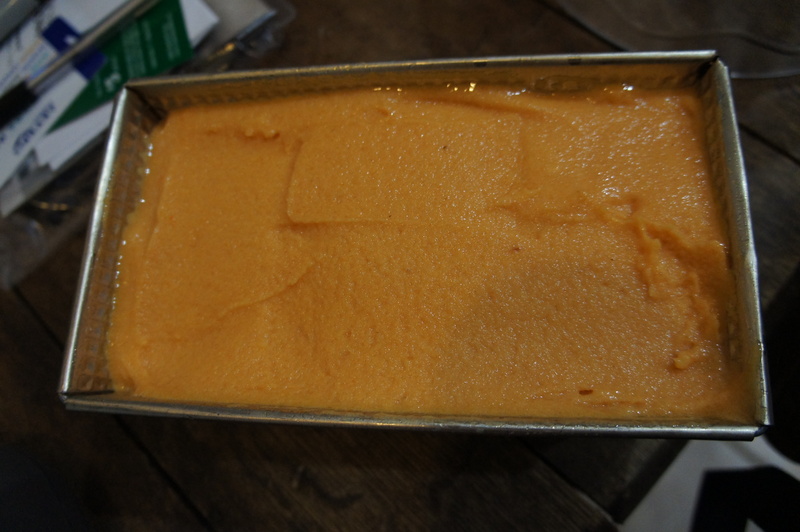 Serve immediately or transfer to an airtight container and chill in freezer for 4 hours for a firmer texture. Sorbet’s consistency will remain soft.